With already over 15 missions under our belt, we have mapped just about any landscape with our drones. But the one thing we haven’t done yet is to give marine conservation a hand. 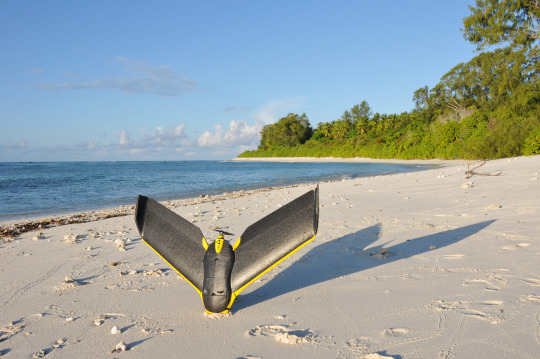 Mapping St-Joseph atoll in the Seychelles and acquiring high-resolution aerial images to identify shark and ray pups seemed like the perfect challenge to introduce our drones to the salty and wet air of marine conservation. Marine environments are subject to harsh environments and long distances, a serious challenge for drones. So when the SaveOurSeas Foundation asked us if we could help them with mapping St-Joseph atoll in the Seychelles and acquiring aerial imagery for the various marine research projects under way in the atoll, we naturally said “Absolutely yes, let’s give it a try!” Even though we couldn’t promise SOSF any results upfront,we were certainly up for the challenge of mapping the 25km2 of St-Joseph and acquiring aerial imagery at very low altitude to detect shark pups, rays and turtles in the shallow water of the atoll. Then again, how could one say no to flying drones and producing stunning maps of one of the most beautiful atolls in the Indian ocean? Acquiring images in this environment means flying long distances over open water, having few appropriate takeoff and landing sites, battling with frequent rain and heavy winds and take into consideration the tides to create a map at the good moment (either high or low tide). To be able to reconstruct overlapping images, the features detected by the mapping software (we used Pix4Dmapper) that turns the images’ features into a map of the atoll, must be identical from one image to the next. With water having no distinct features and reflecting sunlight to make it worse, the chance of reconstructing a map seemed just about close to zero. In addition to water, featureless sand and dense forests are the next worst things when it comes to reconstruction, and both were abundant in the atoll. Our first and most important task of the mission lay in establishing a high-resolution map of the entire St-Joseph atoll. We reached D’Arros island and St-Joseph by charter plane and flying in, we discovered that the atoll was full of underwater features that could be seen distinctively through the shallow water. Bursting with hope, we couldn’t wait to unpack our drones and give it a try, hoping that the acquired images will capture the least amount of sun reflection and maximum amounts of underwater features, which would give us a good chance that the images could be reconstructed into a map. 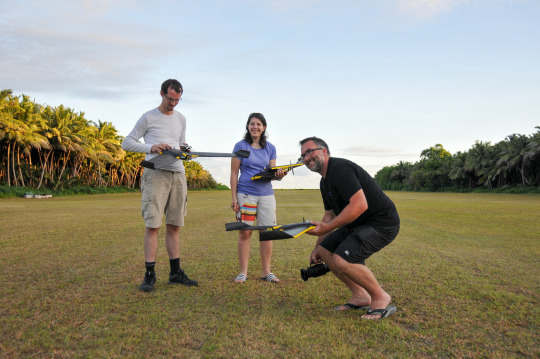 As soon as we were off the plane, we sent out a first drone and acquired images of a small part of the atoll to test the outcome. We processed the images over night and were overly excited the next morning to discover to our big relief that the images perfectly reconstructed into both a map and 3D model. Now that our most important und urgent issue was solved, we needed to figure out the logistical details. First of all, the take off and landing site. The most appropriate site presented itself on the island of D’Arros. Its airstrip was perfect for soft landings on immaculate grass without having to battle with the fine white sand that makes the beaches beautiful but is no friend to the eBee’s camera when landing. Next on our list was to find the good mapping moment. To create a map with uniform lighting, colors and water level, our best chance was to map the atoll in a very short timeframe, reason why we took along 4 drones so that we could fly them simultaneously and acquire the images needed in just over under two hours. While our flight plans were prepared well ahead, the challenge lay in flying our drones at the ideal moment. And ideal spells out to: good moment according to tide cycles, with few wind and no rain, from a safe location for takeoff that allowed also to maintain radio contact and possibly not during 11am and4pm when the sun was reflecting too much light on the water. Thanks to the great weather, we found these “ideal moments” twice, both during high and low tide, and were able to acquire close to 1’800 images each time. The images then reconstructed perfectly into 2 different maps with a resolution of 15cm to the pixel each, that we shared instantly with the researchers on site. First analysis by Dr. Rainer von Brandis, scientific director of the SOSF D’Arros research center, of the newly created maps allowed for identifying important changes of both island shores and changes in sand banks in comparison to the Google maps and satellite imagery currently used. 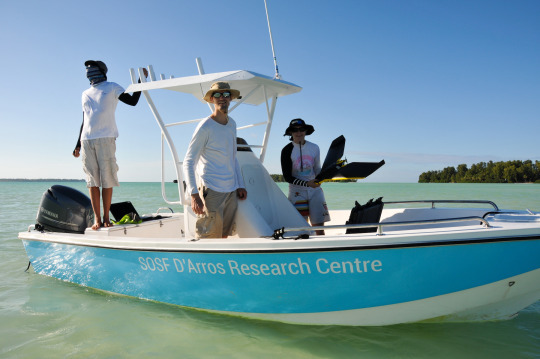 Further analysis will allow the SOSF researchers to establish features of the atoll environment, such as coral reefs, that have not been able to be identified up to now due to the low resolution of the maps currently used. In addition, as our maps are actually not just maps but geo-referenced true orthomosaics, the D’Arros research will be able to measure distances and features with a certainty of up to 30cm as well as geo-localize any spot in the atoll with the same precision, two new possibilities that will be very useful for all future research work on site. The orthomosaic of St-Joseph atoll at high tide (total of 25 km2). Zoom in to appreciate its full beauty! 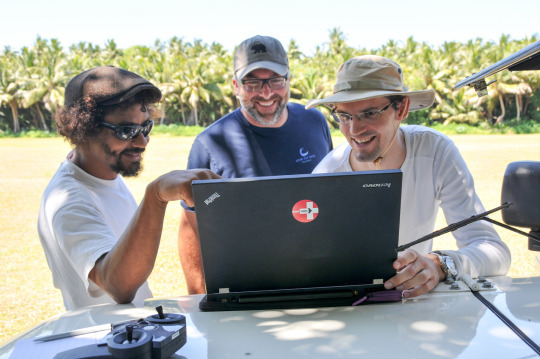 With the maps of the atoll in the bag, we were ready to move on to the next goal we set ourselves: flying our drones at very low altitude, 50 meter and possibly lower over the waterline, to acquire aerial images for transects and species analysis. 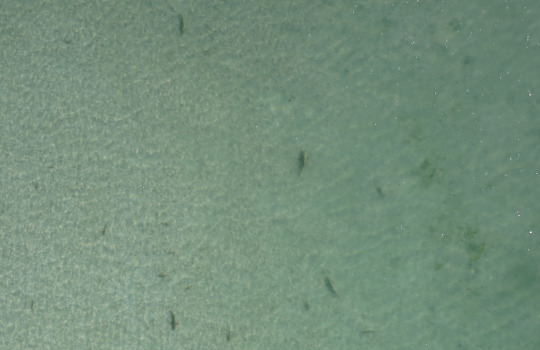 Just the idea of capturing images of shark pups smaller than 20cm long was motivation enough to overcome the fear of flying so low over water and up to 7km away from the closest takeoff and landing site, a risky venture. The areas and transect lines established for these flights matched up with the exact locations of previous transects lines done by boat and species counts established on foot in the shallow water. 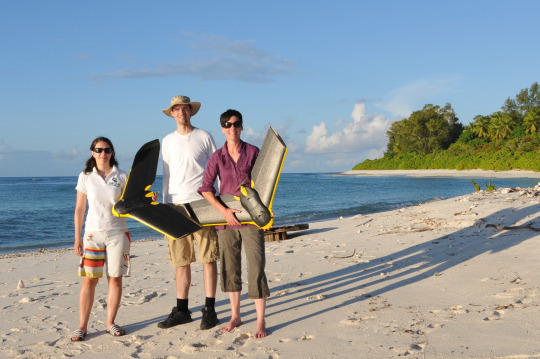 The D’Arros researchers were interested in close-up, high-resolution aerial imagery of shark and ray pups in the shallow water of the atoll during high tide, as well as the coral reefs in certain areas. After some initial test for lowest altitude possible, without having blurry images and risking to sink our eBee’s, we set the ground sampling distance to 1cm which meant flying at approximately 25 meters above the water level. Our test flight, done directly in the atoll and taking off from the researchers boat to be able to check on the eBee while flying low,went smoothly. All we needed to do then was to wait for the next high tide and pray for a windless day, which occurred the next day. We sent our four drones off to fly over the designated areas, clicking away photographs with the shark and ray pups not imagining in their wildest dreams that their picture was taken from so close above. 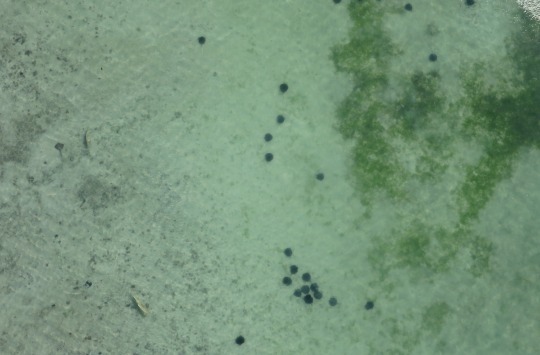 Counting sharks and rays using drone imagery has the advantage of not interfering with the species’ habitat, as is the case in traditional transects and counts done by boat and on foot. 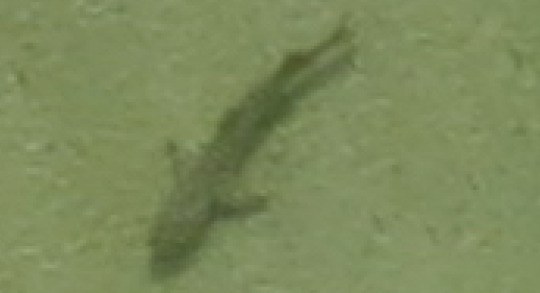 This makes counts more correct and precise as each individual shark or ray is only counted once.In addition, the sharks, rays as well as turtles identified on the images allow measuring the species size with high precision as 1cm corresponds to 1 pixel, hence zooming in on the image allows to count the number of pixels that make up the pup. Now it is up to the D’Arros researchers to analyze the hundreds of images on their computer screens, identifying, counting, measuring and geo-referencing the many shark pups, rays and turtles photographed. Thanks to the great weather and smooth flights and landings, we had some time left and the researchers identified some additional challenges for us. One of them was to identify the health of trees on one of the islands in the atoll. The researchers have been spotting over time that more and more dead trees or trees dying off could be spotted from the boat when cruising by. However, the vegetation of the island being so dense, it was impossible for them to quantify the reach of the dying trees on the island as a whole, very certainly due to the sea level rising and pushing up saltwater in to the groundwater of the island. We used one of our drones, equipped with a near-infrared camera to map the complete island and converted the images not only into a map but also a vegetation index. A first quick analysis showed that trees are dying off or are under heavy stress not only at the shoreline of the island, as spotted by boat, but even more extensively inside the island. Another question the researchers were heavily interested in was to identify new turtle nests on the beaches, using thermal imagery. While the chance was slim that this would work out, it was certainly worth a try. 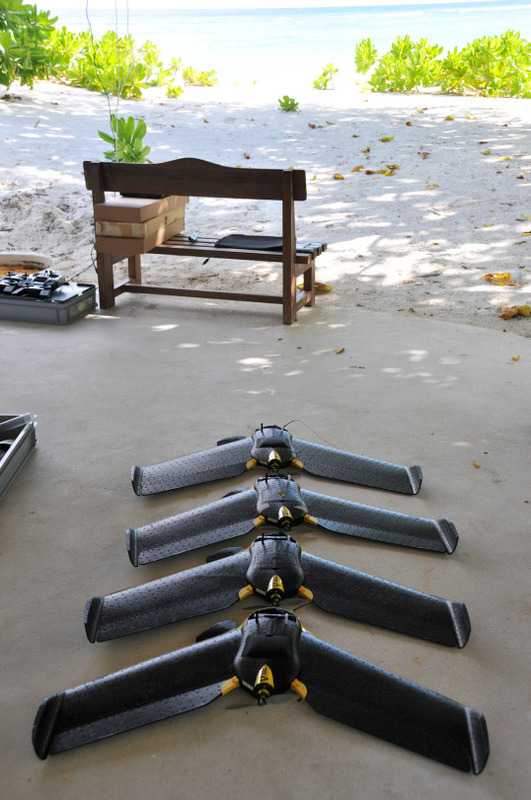 So we equipped one of our eBee’s with a thermal camera and flew it along the shoreline of D’Arros island, known to accommodate a heavy activity of turtles’ nesting over night, to acquire thermal imagery along the sandy beaches all around the island. We chose to do this at 5am in the morning, as this must possibly be one of the coolest moments on D’Arros, though the temperature still read 28°C at this early hour. Filled with excitement after our first night flight on D’Arros, we quickly scanned through the over 5’000 acquired thermal images on our laptop. And were disappointed but not surprised to find no difference in temperature and therefore color in the image on the sandy beaches. This failure to produce meaningful data was very certainly due to the facts that the difference in temperatures was to small and the turtle nests too well covered with sand and hidden under shrubs, conditions where nature even beats our disrupting technology. 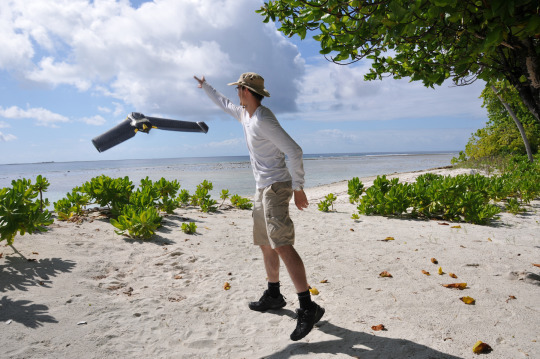 We left the atoll overly happy, with the satisfaction that we could bring answers to questions such as “can one map an atoll with drones” or “is drone imagery good enough to spot animals in marine transects and research areas”, having lots of fun on top of it. Now the work lays in the hands of the D’Arros researchers to analyze the data produced and use the maps produced as a baseline for all future research.